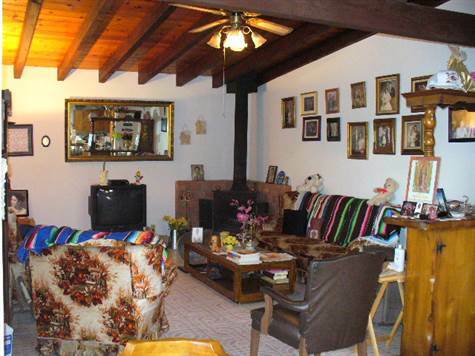 Playas de Rosarito, Baja California - This home is located in the established neighborhood of Colonia Crosthwaite, just east of Quinta del Mar Plaza in downtown Rosarito. Shopping, restaurants, night life and services are all within walking distance of this home. The large 6,420 square foot lot has an over 1,500 square foot main house which consists of a spacious living area featuring an open beam ceiling, fans to cool you down during the hot season and an airy feeling with the enclosed, screened, indoor patio just outside the living area. There are three large bedrooms and two and a half baths as well in the main home. Outside there is a separate 600 square foot apartment which is renting for $300.00 per month with two bedrooms and one bath. With the apartment rented, you have a more secure environment because there is almost always someone home or use it as maid’s quarters. The driveway has enough room to park four cars and the lot is fully enclosed by a locked gate for entry. Although the outside area is fully cemented, there are plenty of potted plants landscaping the patio. The 15 year old home is built by US standards using 2x4 construction with fully insulated walls and stucco outside. There is also, a laundry room outside and two hot water heaters to avoid ever running out of hot water. Because this is an established neighborhood, most all the homes in the area are owner occupied which creates a safer environment and it shows. You see kids running around and the neighbors talking, as well as looking out for each other. You can find other homes of this caliber in the area but not at this low of a price. It is ready to move in for only $199,000.00. Call to set an appointment to see all that is Baja!